The first element is the basic set of flying rules that pilots follow in the air and is discussed elsewhere in this web site. These are much like the traffic rules that motorists must obey. The second element is the multitude of electronic navigation systems and instruments that pilots use to remain on course. The third element is made up of air traffic controllers and the electronic systems they use to track aircraft during takeoff, flight, and landing. These three elements work together to keep aircraft safely separated in the air and to avoid collisions. Here we try to brief the second and third elements which go together to form a great engineering achievement in Air Traffic Management. Navigation systems assist pilots in flying from one airport to another. These systems help both pilots and air traffic controllers determine an aircraft's position relative to the ground and to other aircraft. At high altitudes, or during bad weather, navigation systems are essential for safe aircraft flight. Navigation systems have developed from primitive ground-based radio transmitters to sophisticated space-based systems. Following ground equipment guide all aircraft (as an automated Air Traffic Control Service provided by Electronic Engineering staff) to it’s destination and are discussed in order of usage. Technical explanations of the following headings are described in great detail in a separate page. Therefore, if you are interested in learning further, please click the relevant links. The commonest, and one of the simplest of aids is the Non-Directional Beacon. It is used to mark airways, when its useful range may be up to 100 miles, and as an approach and landing aid, sometimes referred to as a Locator Beacon, when its range will be about 15 miles. It consists merely of a radio transmitter in the medium frequency band which sends out a continuous steady note in all directions. A callsign of three letters in morse code is superimposed at regular intervals as a check that the desired beacon has been tuned in. The Automatic Direction Finder (ADF), or radio compass, fitted in an aircraft will, when tuned to the appropriate frequency, indicate the relative position of the transmission source by means of a needle on a dial. The great disadvantage of the NDB is that it is very prone to interference. For example a thunderstorm cell in the area will often cause the cockpit needle to point to it in preference to the beacon. Two NDBs positioned at Bandaranaike International Airport designated as ASL (Airport South Locator) and CNL (Colombo North Locator) are deteriorated and not in a position to provide their services to the fullest capacity. DVOR is the basic Electronic navigation that in use today. That is an aircraft flies from one DVOR to another (This explanation will be added soon to the site) . This DVOR navigation method relies on ground based transmitters which emitted signals to DVOR receiver in the aircraft. The DVOR system operates in the VHF frequency band, from 108.0 to 117.95 MHz. For optimum operation the aircraft must be on the minimum altitude of 1000 feet above ground in order to pick up an Omni signals service range. Most VOR stations also have distance-measuring equipment (DME). A display indicator in the aircraft reads the signals and tells the pilots if they are on course and how far they are from the station. VOR-DME systems are limited in range to 160 miles and can only provide direct courses to or from a given station. Following diagram shows the flight route between Katunayaka (Sri Lanka) to Trivandrum (India) and DVORs are marked as big circle along with their identification. This map and the cockpit DVOR readings guide the aircraft to the destination. What you see in a normal cockpit DVOR display is as follows. Rotating Course Card is calibrated from 0 to 360 degrees, which indicates the DVOR bearing chosen as the reference to fly by pilot. Omni Bearing Selector or OBS knob , used to manually rotate the course card to where the point to fly to. TO-FROM indicator. The triangle arrow will point UP when flying to the DVOR station. The arrow will point DOWN when flying away from the DVOR station. A red flag replaces this arrow when the DVOR is beyond reception. Course Deviation Indicator (CDI). This needle moves left or right indicating the direction to turn the aircraft to return to course. The horizontal dots at center are represent the aircraft away from the course . Each dot represent 2 degrees deviate from desired course. The Airbus DVOR indication a bit different from above and you can view your radial indication from two displays and looks as follows. The diagram on your right has been extracted from Navigation Display (ND) of A330. VOR needle points towards the current VOR bearing. Bottom needle symbol shows identifier and tuning. The pilot can set DVOR receiver to selected ground station or another word is to select a radial to define a magnetic course toward or away from DVOR station on his receiver. As the point 360 is representing Magnetic North, when we called out, we called in three digits such as 090 that means on the East and 270 means on the West. The proper time to tune navigation receivers is while the aircraft is on the ground because the pilot has to do the flight planned. After takeoff, usually start from altitude of 1000 feet minimum above ground level, the DVOR receiver will get signals from transmitter. When the aircraft has reached to next DVOR station and DVOR receiver get that signals from next station. At this time, pilot should select OBS to Radial of next DVOR station. While VOR gives accurate, specific directional information, it cannot make explicit distance measurements. The pilot, however, may find his distance from the station by taking an intersection of radials from two VORs, or by doing a timed radial maneuver with a single VOR. A simpler answer is to use DME which is associated closely with VOR, the combination providing an accurate position fix. A special transmitter in the aircraft sends out pulses in all directions and these are received at the DME station on the ground. As each pulse is received an answering pulse is automatically transmitted and this is picked up in the aircraft. It is in fact the reverse of secondary radar. As the speed of radio waves is constant at 186,000 miles per second, a computer in the aircraft which measures the time interval between the transmission of a pulse and the receipt of the response can convert this time interval into a distance and display it to the pilot in nautical miles. It should be noted, incidentally, that the height of the aircraft affects the distance measurement; when directly above the station at 36,000 ft the instrument will show the aircraft as still being six miles from it. This is because the DME measures slant range rather than ground distance, but it is of little importance except when very close to the station. DMEs are normally co-located with VORs and the frequencies of the two installations are 'paired'. For example, the VOR frequency of 112.7 MHz is always matched by a DME on Channel 74, a VOR on 114-9 by a DME on Channel 96 and so on. This means that aircraft equipment can be arranged so that the selection of a particular VOR frequency automatically means that the related DME channel is selected at the same time. The ILS stations are installed in all the international airports, which support the landing aircrafts with instrument guidance under adverse weather conditions. ILS is used to provide the pilot, precision information of the aircraft direction so as he lands the aircraft, if it is possible, to touch the ground in the specific point. This point should be the centerline of the runway and be at the beginning of the runway. In addition, aircraft is landed at an angle of 30. So, the two of the landing guidance (i.e. runway centerline and 30 angle landing path) are provided by Localizer and Glide path respectively. The lateral and vertical guidance is necessary for a pilot to fly a precision approach, where glide slope information is provided. A precision approach is an approved descent procedure using a navigation facility aligned with a runway where glide slope information is given. When all components of the ILS system are available, including the approved approach procedure, the pilot may execute a precision approach. The system reliability depends upon the equipment maintenance, the installation quality and the environmental conditions (mountains, buildings, climatologic conditions). For this reason, there is a theoretical study all the above conditions, which must not change after the installation. ILS stations are classified in the following three categories with respect to the reliability. This permits the precision aircraft landing in a DH (Decision Height) up to 200 feet, upwards of the ILS Reference point. The ILS Reference point stands about 150 meters from the aircraft touch down point with the ground. This permits the precision aircraft landing in a DH up to 50 feet, upwards of the ILS Reference point. This permits the precision aircraft driving in an altitude up to surface of the landing runway. At Bandaranaike International Airport provision is available for category II. The primary component of the ILS is the localizer, which provides lateral guidance. The localizer is a VHF radio transmitter and horizontally-polarized antenna array that radiates approximately 100 watts of RF power (between 108.10 MHz and 111.95 MHz). The transmitter and antennas are on the centerline at the opposite end of the runway from the approach threshold, as seen by the aircraft on approach to landing. The localizer station radiates a beam of Information indicating the horizontal centerline of the runway. This beam is produced by two transmitters operating on the same channel frequency but amplitude-modulated with different audio signals. The localizer station is identified by the transmission of a four-letter identification code modulated at 1,020 Hz and also by voice identification. Glide path is a transmitter which gives information of the correct angle slope in regard with the horizontal level of the straight of aircraft slide, during the landing. The typical glideslope transmitter is usually located 750 feet from the beginning of the runway and radiates a 5-watt RF signal from a horizontally polarized antenna array at an inclined glidepath angle of 2.5" to 3.00. The glide slope transmitter operates on one of 40 available channels provided by 150-kHz spacing in the UHF frequency range of 329.15 MHz to 335.00 MHz. Marker Beacons are two or three transmitters which give information about the precision approach, as control points for the aircraft correct direction of the landing runway extension. In the above stations is possible are installed and Compass Locators. 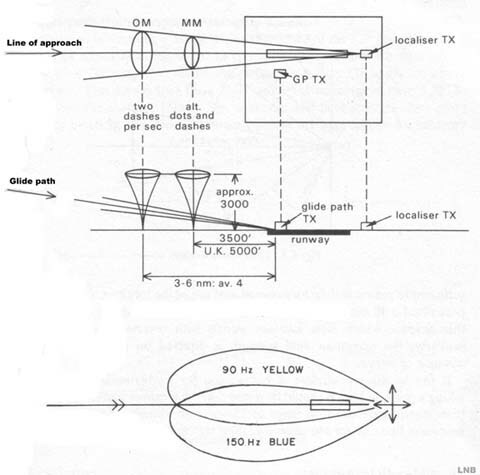 The Outer Marker (OM) is used to indicate that an aircraft should intercept the glide path when over the transmitter. 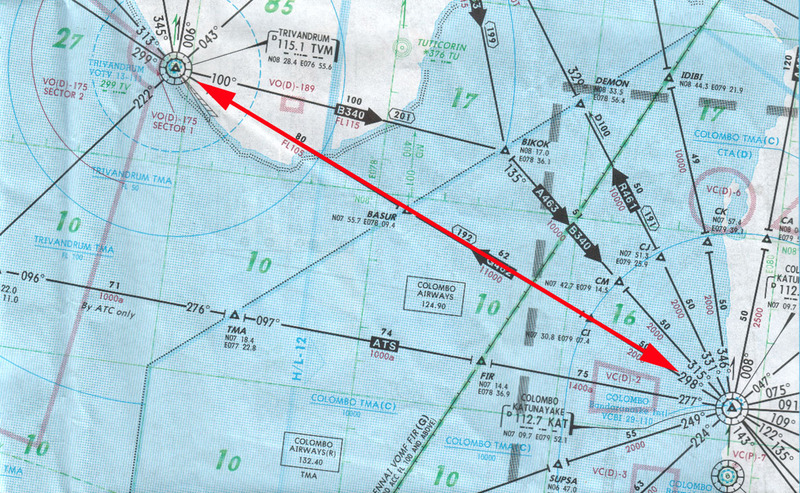 The Middle Marker is used to indicate that the aircraft is at the Decision Height (DH) for most approaches, and an Inner Marker (IM) is used in Category II or III approaches for the serious flights. The Outer Marker (OM) station, located approximately 4.6 miles from the end of the runway, amplitude modulates the 75-Mhz carrier at 400 Hz. The OM station is identified by a 400-Hz audio tone consisting of dashes (approximately 1.5 seconds long), and by the annunciation of a "blue" indicator light on the cockpit instrument panel. Located approximately 0.6 miles from the runway is the Middle Marker (MM) station, which amplitude-modulates its 75-MHz carrier at 1,300 Hz. The MM is identified by a 1,300 Hz audio tone consisting of alternate dots (approximately 0.5 second long) and dashes, and the annunciation of an "amber" indicator light in the cockpit. There are two types of radar systems installed each ATC ground station. The first, called the Primary Surveillance Radar, operates on the principle of sending a narrow beam of energy, which is reflected from the aircraft under surveillance, and measuring its distance by noting the time lapse between the radar pulse transmission and its received echo. The second, called the Secondary Surveillance Radar, operates on the coded reply sent from the airborne radio beacon Transponder in response to an interrogation sent from the ground Radar station. The Radar station at Piduruthalagala(Sri Lanka), the PSR and SSR antennas are co-located and scan synchronized, and both radars are used in conjunction to develop the total air traffic situation display on a single CRT radar scope, called the Plan Position Indicator (PPI). The Radar station at Katunayaka(Sri Lanka) is a PSR type and rotate at a speed of 15 revolution per minute while Radar at piduruthalagala at a speed of 12 rev. per minutes. The reason for this difference in revolution speed is that, as aircrafts approaches close to the aerodromes and surrounding airspace needs constant updates of the positions of the air movements. Intense radio contact with pilots was necessary to verify all related ATC elements like Altitude, Flight level, track, speed etc. Around 1950-55 and due to similar problems of the military aviation to discriminate the known (friendly) aircraft from the unknown (enemy) ones , An additional type of message was added to the existing basic primary radar information by using another type of equipment . Controllers were extremely happy for this technical achievement as the work was drastically simplified. Nevertheless, it had to be simplified now because even more the airspace was becoming congested and the old Primary Radar was showing its limits as an operational tool. Additionally the Mode-S(which is explained in the particular theory page) had to use this selective calling (Roll-Call) for known aircraft but at regular intervals had to interrogate in the classic SSR (All-Call) way just to detect the 'new comers' into the system yet unknown to it . And even then all linking had to rely on the radar rotation . That is an instruction to the pilot input by a controller would have to wait until the radar faces towards the aircraft and then send it . And while Mode-S was on the table the satellites gained the floor and impressively have shown that most of the Air-to-Ground linking can take place simply via the satellites and standard VHF transmissions. Just like using a mobile phone. The system becomes then more simple as the aircraft itself can transmit and receive the data like the user at the other end of a line without depending on the radar rotation. It also looks cheaper as an idea. It was then that Mode-S received a blow on the face and it looked like this would be its end. Additionally the ADS (Automatic Dependent Surveillance) based again on the satellites gave a simple solution on the aircraft detection and communications. The position instead of deriving from the radar it could be known simply by a transmission made by the aircraft itself - by the automatic pilot or rather its FMS ( Flight management System) . The 2 solutions competed bravely but the VHF Data-Link appeared first and was implemented easily while ADS is still on the fight to gain its position in ATC. Such an experimental VHF-Data Link is existing in MASS UAC of Eurocontrol from 1996 and works in a simple way - at the moment for about 40% of the casual traffic that is equipped with the new transponders. Then people thought of Mode-S differently. Yes, to reduce the need for R/T, the radio contact between pilot and controller, the VHF Data-Link is better (the concept of Controller/Pilot Data Link Communications (CPDLC) is explained elsewhere in the site). The ADS can replace radar at least in areas impossible to cover with and may provide a radar display to pilots for self monitoring of the traffic around for advanced traffic information. Both ADS and CPDLC are operational in Sri Lanka at the area control center Ratmalana. · And it may work without embarrassing the controller and/or the pilot as these two will practically do nothing more. Mode-S works on the background without needing the human intervention. The ADS tries to replace both - but it is still under development and it is not officially proven yet. Visit Radar Theory page for more information about the operation.